Just making a few changes--posting may resume soon. It's been a while, but so much is happening now that spring is well underway (or nearly over) I thought I better start doing some updating. The ceiling of the front porch has been deteriorating rather badly over the last few years, so a couple of days ago I pulled it down to get ready for the new one my brother will be putting up in a few weeks. There was no way to do this without displacing the porch spiders, who reappeared from wherever they spend the winter not long ago. 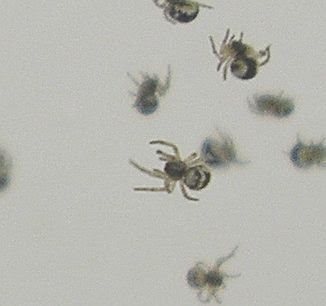 I knew this day was coming, so I'd intended to move the eggs from last fall before they hatched, but I was too late, so there were also masses of young of the year to move as well. There was a rather gruesome drama going on the day I did this, so before I got started I snapped a couple of pics. I've not yet been able to identify these spiders to my satisfaction, but after a few years of close observation, here's what I suspect is their life history. Eggs are laid in the fall to hatch the next spring. Moms are in their second year, and disappear after they lay their eggs, so I think they only live for two years. Newly hatched young, those that survive, spend their first season growing, overwinter, and then in their second season reproduce. They grow quickly through the summer, mate, and lay their eggs. 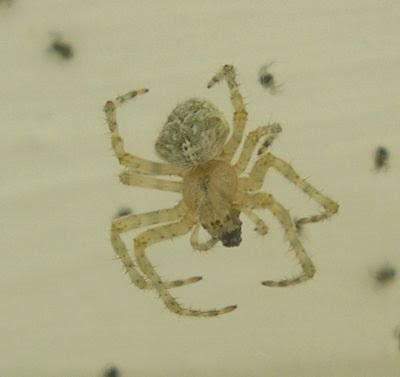 Last year, one spider was too late laying her eggs. The weather changed just as she was spinning the case for them, and she never finished. Last year I got to see a lot of courting (at right, courting couple from last July), fighting among males, and mating (not terribly unlike fighting--a little scary). 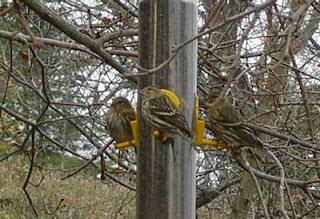 Over the years I have also spent lots of time observing their feeding. These are web spiders, active mainly at night, they wait for prey to hit their webs, then swoop in and wrap them up, sometimes feeding immediately, sometimes saving them for later. They are relatively large spiders, but will take on prey much larger than themselves when the opportunity arises. One got a very large dragonfly last year, for example. But, I learned, they do not always sit and wait. 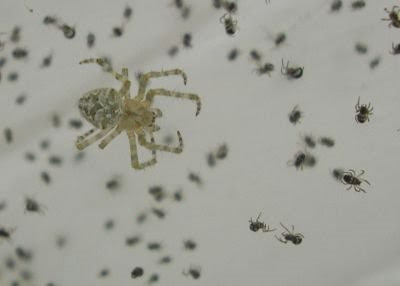 As soon as the newly hatched spiders started to spread out, two adults swooped in to hunt them. This is so out of character for these spiders, I suspect that this is a special tradition for them--cull the young, get a big meal, let this generation invest in the next. Baby spider, there's nothing better! So I was very glad to see it. I would have missed it if the timing had been a little different, and I was also able to move quite a few of the young ones, and most of the adults to trees and shrubs, after watching for a while, in the hope that they will like these almost as much as they like a porch. Did I say "end of an era"? Well, maybe not. 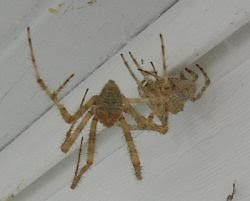 I didn't manage to move them all (a couple were well hidden), so maybe after everything settles down, I will once again be sharing the front porch with a couple of these beautiful spiders. If it's the end of another month, then it's time for the circus, Circus of the Spineless, a monthly collection of the best of invertebrate blogging from around the world. The latest edition (the 24th!) is graciously hosted by Demented Pixie of Naturalist Notebook. Check it out! Next month the circus will appear at The Annotated Budak. International Rock-flipping Day (IRFD) really was international. The following is a list of blog posts and links to a couple of image sites (courtesy of via negativa), reporting/revealing what went on, what was found, etc. 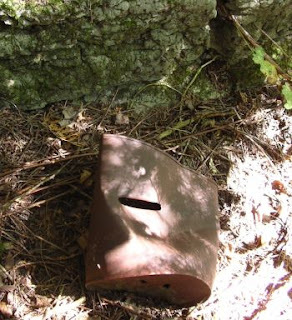 Note, especially, that Fragments From Floyd took the prize for a photo of a non-human rock flipper. Check out also the small but deadly (?) discovery Pablo made at Roundrock. Dave at via negativa will be continuing to update the list on this post as new reports come in--so check in there. Also see his first IRFD post here. The day started well. I was out in the yard looking for the noisy Blue Jay family I could hear in the elms when I saw some other birds flitting to and fro--turned out to be a couple of Scarlet Tanagers in winter plumage, or young of the year or both. Not entirely unknown in the yard during the migration, but always a pleasure to see them. I moved down the lawn watching them and listening to a Pileated Woodpecker who had started to call. Then the Woodpecker flew by me heading east, followed almost immediately by a rabbit running in the other direction. Meantime a couple of warblers (of the confusing fall variety) turned up in the Maple by the house, and then I remembered: Today is International Rock-flipping Day! So after breakfast I headed out across the scrape, intending to go into the cedar bush and the sometime swamp in its midst. I haven't been there for a while because of mosquitoes, but the morning was cool and its getting late in the season. Once I got to the scrape, considering rocks all along the way, I saw a small raptor in the top a dead tree and was distracted. It flew off as I moved towards it, so I didn't get a good look, but I suspect it was a Sharp-shinned Hawk, given the few features I could make out, and the time of year and location. But back to the rocks. Near the edge of the cedar bush I saw a rather attractive rock--might be a good first candidate. I took this picture of it, as they do on CSI, document the scene before disturbing it. Then, as I bent down to move it, I noticed that it was not alone. 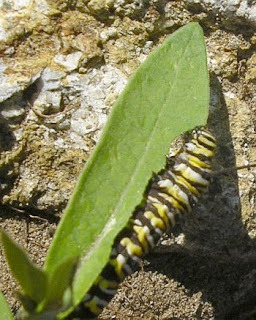 On a very small milkweed plant leaning over the right-hand side of the rock there was quite a substantial Monarch caterpillar munching away. So, another photo, and then I moved on: on to the cedar bush. We had a very dry June here, a nice rainy July and then an exceedingly dry August. The wetland in the midst of the cedar bush was not merely dry, but incredibly overgrown. Elderberries, Clematis, Joe Pye Weed, Jewelweed, Goldenrod, and lots I couldn't identify were tall and densely massed. The landmarks of winter and spring were gone, and I was lost in a few metres. 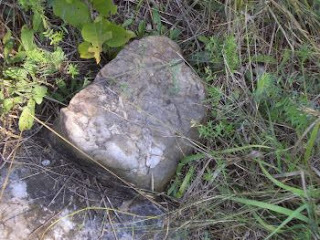 I had pictured finding some rocks that I know are there, that have water running over them in the spring, and would still have dampness underneath them now, but I couldn't even being to look for them. The margins of the spring stream were completely covered up. So I moved into the cedar bush to look for a prospect there. And found this can--in front of a rock, which as you can probably tell was a little too big for flipping without a backhoe. I looked under the can, but found nothing. Meantime I myself had been found: A couple of chickadees had turned up to give me hell for being back there. I watched them for a while, even pished back, then just as they were getting bored with me a small flock of warblers came on the scene. Some of the "confusing" variety, a pair of American Redstarts, and what I am pretty sure was a Blue-winged Warbler. This last one is always of interest to me, even as a migrant, because of the role it plays as parent to the hybrid Brewster's Warbler, of which I've written often (here, for example, or here). So I spent some very pleasant moments peering up into the cedars, trying to see the warblers before they too moved off. Then I decided to take my quest to the Far Field (that is, the young forest on the western side of my regular walk). Now this was an interesting rock. It was in the sun and the area around it was relatively dry, but this rock was wet. 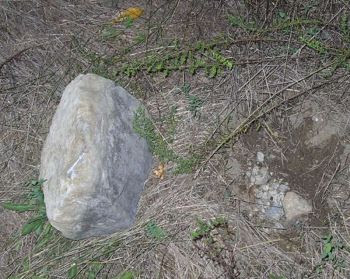 I could tell that it had been in this spot for sometime when I looked underneath it, but I couldn't help thinking that someone or something had just turned this rock over and left it in place upside down....Who? Why? Underneath it there was a very large cricket that fled immediately and a colony of very shiny, small black ants, including one winged one. 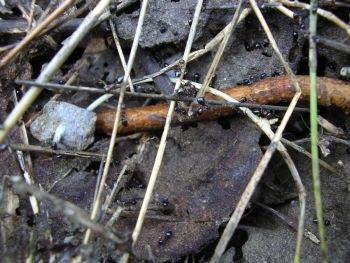 Ants are the invertebrates found most often under the rocks around here. I know a little something now about moths and butterflies, I know some of the spider families and a few species, I even know a few true bugs, and other insects, but of ants all I know is that there are many, many species represented around here and I don't know the names of any of them. Under any rock I might see a species I've never seen before, as was the case here, I believe. Still, it was good to finally find a happening rock. 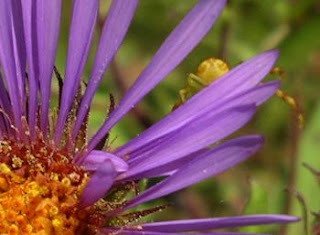 I continued down the Far Field, noticing the beautiful purple asters of fall, and yes, peering into them for flower crab spiders. Of course I found one, not Misumena vatia, but a crab spider nonetheless. You can see it just going over the edge, being camera shy. 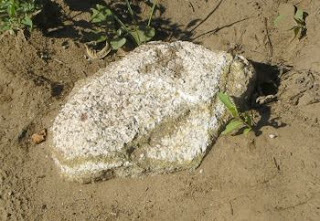 At the north end of the Far Field, in a small area that has been bulldozed some, there is a rockpile around the base of a small tree. This is where another year a very vocal groundhog screamed at me without ever showing itself. Nobody took any notice of me today as I peered into the pile and moved a rock or two. I knew that there could be something interesting in there anyway, snake perhaps. But I didn't want to take the pile apart, and then be stuck with trying to figure out how to put it back together again, so I photographed it and left it, capturing one of the more interesting of the yellow butterflies that were so numerous this morning; there were maybe three quite similar species flitting around, too quickly to get a fix on. 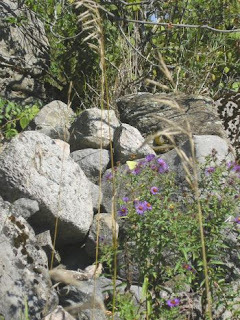 Okay, I looked at birds, I looked at butterflies, I looked at flower spiders, but I flipped a couple of things, and better I found that thinking about rocks broadened my attention to include more of the features of the land. In short, it was a good time. Thanks to Dave for proposing it. And watch here for a list of links to the other participants in the event we call International Rock-flipping day! a day for everybody to go outside — go as far as you have to — and flip over a rock (or two, or three). We could bring our cameras and take photos, film, sketch, paint, or write descriptions of whatever we find. It could be fun for the whole family! I found this flipped rock last year, so it won't qualify. Oh yeah, and the bear had already gone when I snapped the picture. But I'll be on the lookout. To find out more about International Rock-flipping day click here. Or read Bev's post at Burning Silo, here.